It’s the second day of My Life According to Pinterest’s “One-derful” Birthday Bash! If you missed the kick off yesterday we started the Birthday Bash with a review and giveaway of the Combi USA Coccoro Convertible Car Seat! Click here to enter. 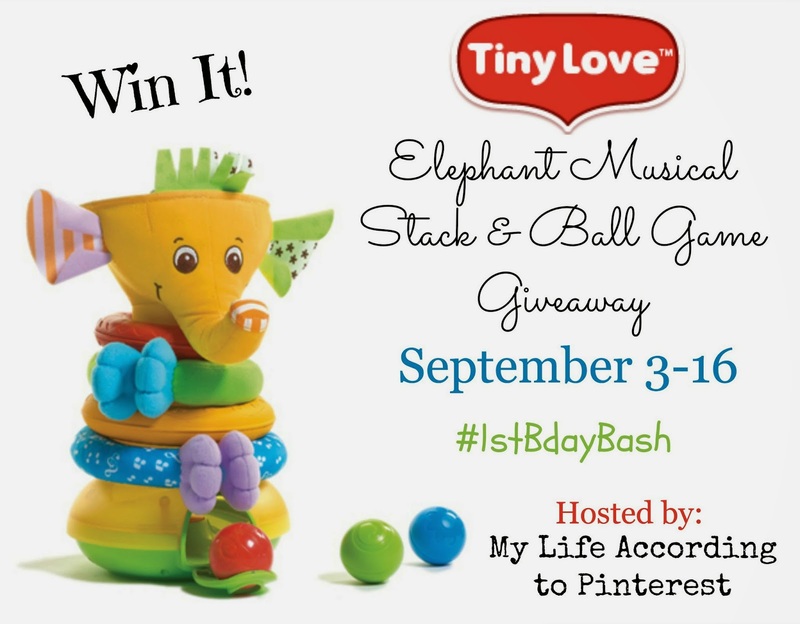 Today we’re giving away an Elephant Musical Stack & Ball Game from Tiny Love. This is a perfect present to celebrate the first birthday of any little one in your life! This toy is one your baby will love from 6 months and beyond. It’s a ring stacking toy, rattles, and ball dropping game with 2 levels (wide and narrow openings) all in one! Not to mention this is super cute and colorful and makes some fun music and lights up when your little one gets the balls in the opening. My son absolutely loves this toy! It can help your little guy or girl develop fine motor skills and cognition. You can check out my full review of the Elephant Musical Stack & Ball Game here. I love these types of toys! They are perfect for building hand and eye coordination! Click here for a list of all of the “One-derful” Birthday Bash Giveaways!